If there's one thing I've always coveted since moving Tasmania it's a glut from my very own garden. You know, so much fruit that you don't know what to do with it all. You make jam, you preserve some, you eat some and you give away some, and yet there's still loads of fruit left over. This week I can finally cross that wish off my list. Our mulberry tree, which is six years old now, is positively groaning with dark purple fruit. "On New Year's day, 1949, people gathered to watch Oriel Lamb move her things out to the white tent beneath the mulberry tree at Cloudstreet." Ever since I read that line, I've hankered for a mulberry tree. Coudstreet, is easily one of my all time favourite books and that story of Oriel's white tent covered in purple mulberry splotches just captivated my imagination. I had to have such a tree in my own garden, not because I particularly love mulberries, but because I love the character of Oriel Lamb. My tree arrived in a box, in the mail, and it was tiny slip of of a thing when I planted it. It grew so quickly that it couldn't support its own weight and giant branches would blow off in the strong spring winds. I imagine it would be twice as tall now if at least half of its boughs hadn't blown away. But this glut, the first we've ever had in our garden, has been a delightful surprise. It's the first time the tree has ever fruited. We all stand hidden in the branches munching purple fruit. We hang around the tree and talk when visitors drop in, snacking away as we chat. Our hands are stained an inky purple, and the children splatter their arms with "blood" and let the juice trickle down their skin. The grass below is littered with purple berries. There's enough mulberries to gorge ourselves outside, and plenty left to bring into the kitchen. So far I've made jam, and frozen some and today I made a cake. And when you cut a slice, it reveals purple splotches, that remind me of Oriel's white tent beneath the mulberry tree at Cloudstreet. Preheat oven to 180C. Grease and line a 23cm x 13cm loaf tin. In a medium bowl, combine flour and ground almonds. Using a stand mixer, beat butter and sugar until pale and fluffy. Add eggs, one at the time, beating well between each one, then add the lemon zest and juice. Reduce the mixer speed to low and add 1/3 flour mix, then a third of the yoghurt, repeating until all the ingredients are combined. Spoon a third of the cake batter into the loaf tin, then sprinkle a third of mulberries. 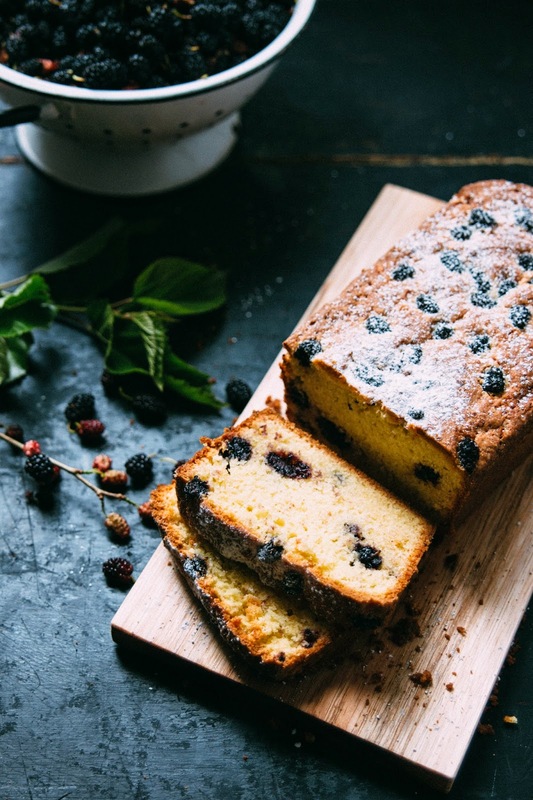 Continue layering the loaf pan with batter and berries, finishing with the mulberries. Bake in the oven for about 40 minutes or until a skewer inserted in the centre comes out clean. Allow to cool in the pan for a few minutes before turning out on a wire rack. Cool completely before slicing. Serve with tea under the mulberry tree. What beautiful images. I too love Cloudstreet. And mulberries. That's a lovely thought Jude! 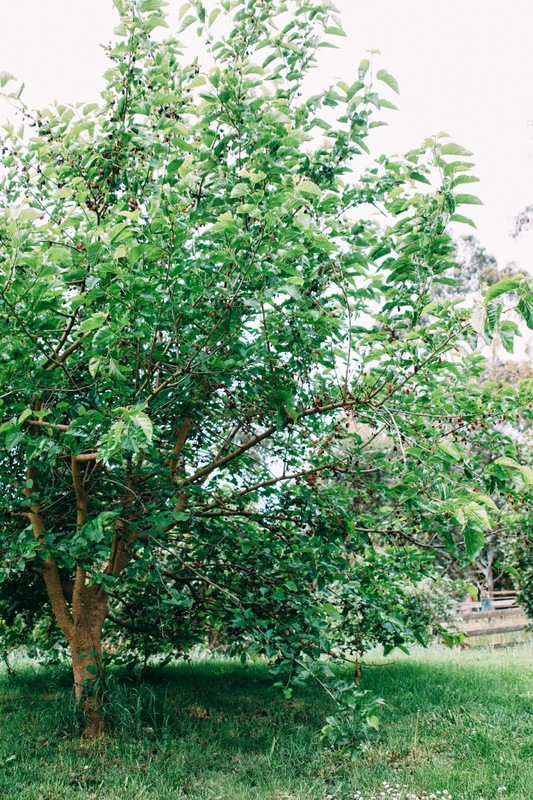 I think a mulberry tree is an excellent choice for your backyard! I tasted my first mulberry this year, hands down my new favourite fruit. I will have to check out Cloudstreet. Cloudstreet is such a wonderful story Kitty, I hope you like it. I love when little passages of a story stay with me long after I've read the book....especially ones that capture my imagination. that's always a good book! Mulberries with cream and sugar sounds delicious! I will have to try that. How lucky to grow up with loads of mulberry trees nearby. This sounds delicious! 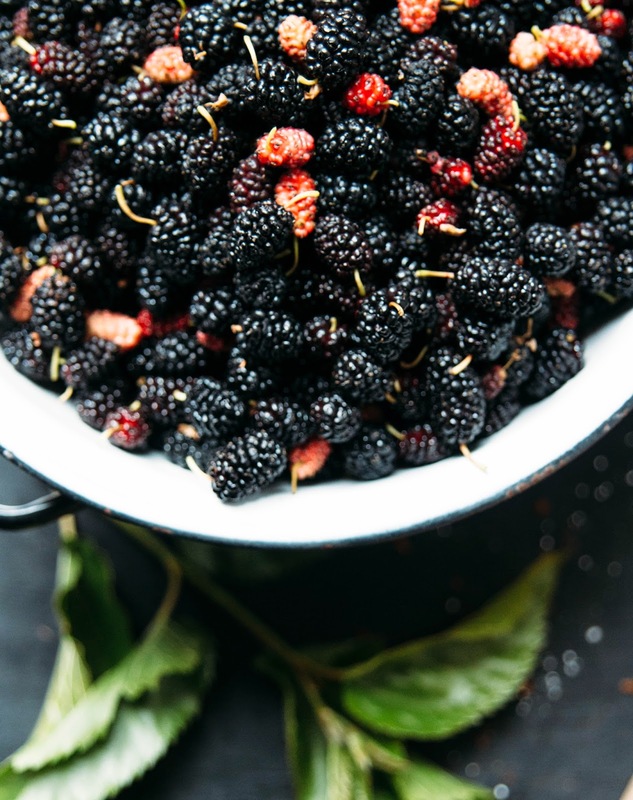 I've never had a mulberry before, not sure if they're available in Wales - is there another fruit you can recommend as a replacement if mulberries aren't an option, they look a little like blackberries but as I've never tasted a mulberry I wouldn't know if blackberries would be suitable! Blackberries would work perfectly well and so would raspberries! When I was a kid, we used to have silk worms and they feed off the leaves of the mulberry trees. It was like the local water holing. Loads of parents standing around on a Saturday morning talking to each other while their kids picked leaves off the tree for their boxes of worms and ate the purples berries. If we were allowed to go on our own, we would use our Tshirts as a container for the berries to take home and eat with yoghurt but it caused huge stains and we'd always be in trouble. Mulberry trees are full of memories for me. I love your mulberry tree memories Samantha! Thank you for sharing! Trying to get mulberry stains out of clothing myself I can see why you got in trouble - stubborn things they are. Oh Michelle, as soon as I started reading that quote from Cloudstreet a smile crept across my face. I, like so many others, LOVE that story & I love your story too. Such a beautiful sentiment and oh, to have a glut of berries from the garden! 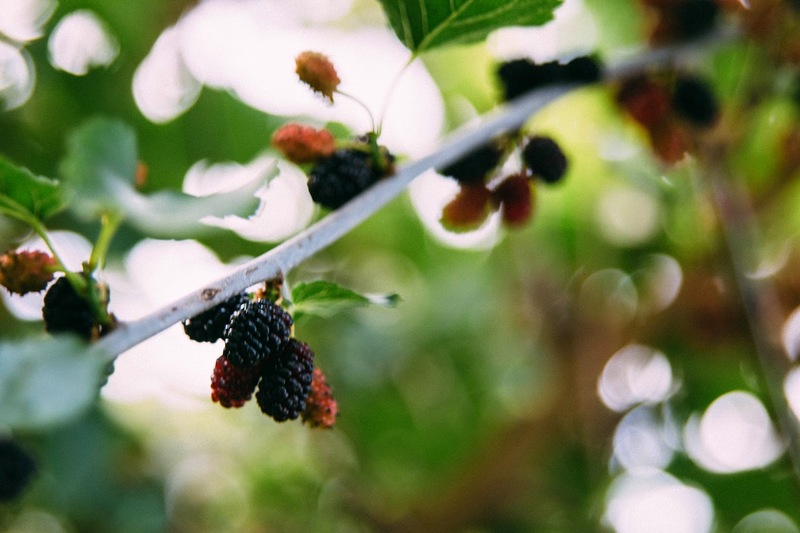 I have dear memories of an afternoon spent picking and eating mulberries with a childhood friend so many moons ago. A mulberry tree might just need to be the very next addition to my garden. Lovely words & photos. I too will have to look at reading Cloudstreet. What delicious imagery! I haven't read Cloudstreet, or indeed, eaten mulberries, but now I fervently wish to do both! 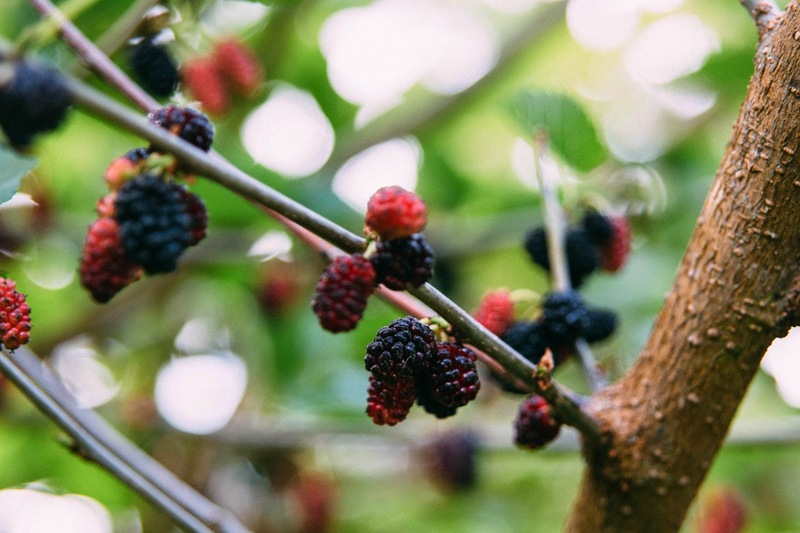 I desperately want my own mulberry tree-I had one as a child-but hubby refuses to let me plant one as he doesn't want birds pooping purple on our washing line. Maybe I should plant a white mulberry tree?